Even with cutting back, buying sales, and strategic meal planning and grocery shopping, many families are still seeing an increase in what they are spending on food and household supplies. It isn’t so much the increase cost that is driving our family back to the land, but the extreme dependency that we find ourselves in. The majority of people depend on stores for every bit of their food. We have lost the know how and the work ethic to be able to produce our own food. That’s a dangerous place to be in! I was intrigued by an article I read on ABC news called, “Dollars From Dirt: Economy Spurs Home Garden Boom”. Industry surveys show double-digit growth in the number of home gardeners this year and mail-order companies report such a tremendous demand that some have run out of seeds for basic vegetables such as onions, tomatoes and peppers. 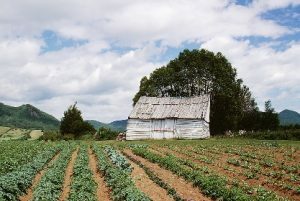 Gardening advocates, who have long struggled to get America grubby, have dubbed the newly planted tracts “recession gardens” and hope to shape the interest into a movement similar to the victory gardens of World War II. This week the current White House broke ground on what will be a 1, 100 square foot garden on the lawn of the White House…the first plot garden since Eleanor Roosevelt’s victory garden. Seed companies say this renaissance has rescued their vegetable business after years of drooping sales. Orders for vegetable seeds have skyrocketed, while orders for ornamental flowers are flat or down, said Richard Chamberlin, president of Harris Seeds in Rochester, N.Y.
Business there has increased 40 percent in the last year, with the most growth among vegetables such as peppers, tomatoes and kitchen herbs that can thrive in small urban plots or patio containers, he said. Harris Seeds recently had to reorder pepper and tomato seeds. While I think the majority of the garden interests springing up is merely a “let’s try our hand at this” approach, still, it is a serious resurgence and noticeable increase in gardening. I think a lot of people are connecting the dots on our food vulnerabilities and dependencies. But the reality is probably only a small percentage of people will actually do something about it. Thanks for the great article link! hi there, glad to be back on and reading your posts. I have missed being here. loved the post really interesting. This is really interesting! We have been gradually adding more garden space on our city lot for a couple years. This year it has doubled. With a household of eleven, we are definitely trying to add to our food budget! This is my first time on your blog, but I will be back. Thanks for lots of interesting reading!